Strategy Analysis - What, how and why? Ace the case - What, how and why ? IIBA business analyst certifications like CBAP and CCBA are well-respected certifications for business analysts. The certifications adds value to your profile and may open up doors for better opportunities. However, these certification exams are not so easy to crack. There are several factors, which makes it tough. 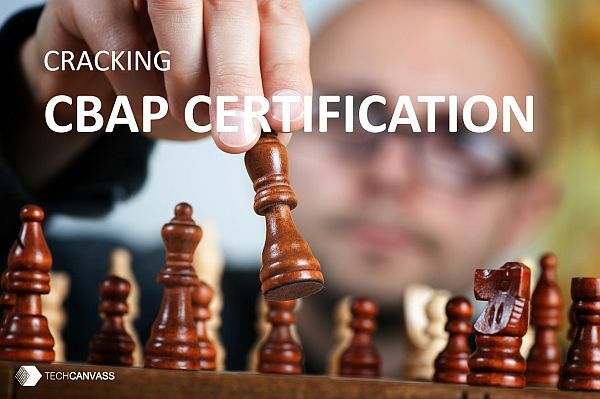 In this online session, a CBAP v3 certified professional will take you through an optimized preparation roadmap/strategy to crack the exam with 10-weeks of preparation. One can face multiple challenges while preparing for the exam. Reading and understanding the BABOK guide is possibly the first challenge, you will encounter. Next challenge is to find the right set of questions to practice for the exam. As you know CBAP and CCBA exams have case studies and scenarios based questions. You may not be able to get them right by just reading the BABOK. In this session, the speaker, who is a CBAP certified professional will discuss a detailed and step by step strategy to overcome all the challenges and crack the CBAP in 10 weeks. How did I crack the certification? Each of the participants will receive a copy of CBAP/CCBA sample revision guide chapter with 30 questions for practice. You can discuss the answers with the expert every alternate weekend. There are no answers provided for the questions. The event is over, So you cannot register now. Saurabh was born, raised and educated in India. Immigrated to Canada in 2001. Became a naturalized Canadian citizen in 2006. Saurabh is an accomplished IT professional with Telco, Retail, Banking & Government verticals in North America. He has extensive working experience in Enterprise Reporting Solutions, CIO/CTO KPI (Key Performance Indicator) Presentation, Enterprise Performance Management Solution Implementation, Performance Management Framework Analysis, KPI/Scorecard Analysis & Development. For the last 17 years, Saurabh has worked with the largest and well-respected companies in Canada like Hudson’s Bay, HSBC Bank Canada, Bell Canada, Rogers Communication, Toronto Transit Corporation & Royal Bank of Canada. He helps in Analyzing process designs and defining KPI’s and Dashboards, measure customer experience and operations. Helps Process experts with Continuous Improvement initiatives. He holds an Undergrad B.Sc. Degree in Math from MKU University, India and is a certified Business Analyst with a CBAP® designation. In this CCBA CBAP tutorial on Data Dictionary, we will cover the basics of this 10.2 BABOK v3 technique. Data dictionary may not be a commonly used vocabulary in your day-to-day business analysis world, but it is an important concept.